Seven area women will be participating in two separate walks this weekend to raise money and support for cancer research. Pictured from left, at a Christmastime fundraiser, are Samantha Smith, Sabrina Hayman, Kendra Thompson, Brandy Hudnall, Shayla Blackshire, Michelle Hart, and Jill Harris. Blackshire and Hart will be doing a two-day walk in Atlanta, Ga., while the remainder of the women will be walking three straight days in Philadelphia, Pa.
OHIO VALLEY — They come from all walks of life, the accounting department, secretary, student, teacher, postal worker, school counselor, and social services, but this weekend they will join for a common goal – to help eradicate cancer. Seven area women will be walking in either two-day or three-day walks that will benefit cancer research. For some, it will be their inaugural walk. For others, it is a yearly tradition. The Philly walk begins Friday. The five women participating will walk 20 miles each day passing a number of famous sites, including Independence Hall, the Liberty Bell, the Rocky statue, and the Philadelphia Zoo. Blackshire and Hart will walk by, or near, the Atlanta Botanical Garden, World of Coca Cola, and Atlanta Memorial Park. Veteran walker Hudnall serves as team captain of the group. This is her third year walking for cancer’s end. Previously she participated in the “Avon 39 Walk to End Breast Cancer” in both Washington, D.C. and Chicago. The Avon walk was 39 miles in two days. Hudnall said her motivation for the walk is an aunt who is a breast cancer survivor. Harris joined Hudnall last year in Chicago. When the two women found the Avon walk was ending, they began looking for another event. She added she walks for everyone in the community who has battled, or is battling, cancer of any type, not just breast cancer. For the others, this is their first multi-day cancer walk. While six of the women are from either Mason or Meigs counties, Thompson is from Granville, Ohio, but grew up in the Bend Area. Blackshire and Hart are walking for their Mamaw Carole and Uncle Robbie. Their grandmother survived breast cancer and ovarian cancer, but her last struggle was with rectal cancer, Hart said. Both Hayman and Smith are simply doing the walk for the greater good and to help find a cure. For Hayman, it began as a personal goal to get herself in better physical health and she liked the accountability of having to train for a big walk. Smith has run in 5K events, but liked the idea of a challenge, as well. But the women not only had to train physically for their events, they also had to raise money in order to participate. Blackshire and Hart had to raise $1,200 each, while the other ladies had to raise $2,300 each. They did both group and individual fundraisers, including bingo, a glow-in-the-dark 5K, spaghetti dinner, kickball tournament, and raffles. Blackshire said at the school where she teaches, the principal even took a pie to the face to help her raise funds. And, after some of the women met their individual goals, they did not stop until everyone got their money. Harris said she is very thankful for the small community supporting her and the team financially. https://www.mydailyregister.com/wp-content/uploads/sites/24/2018/09/web1_0925.CancerWalk.jpgSeven area women will be participating in two separate walks this weekend to raise money and support for cancer research. 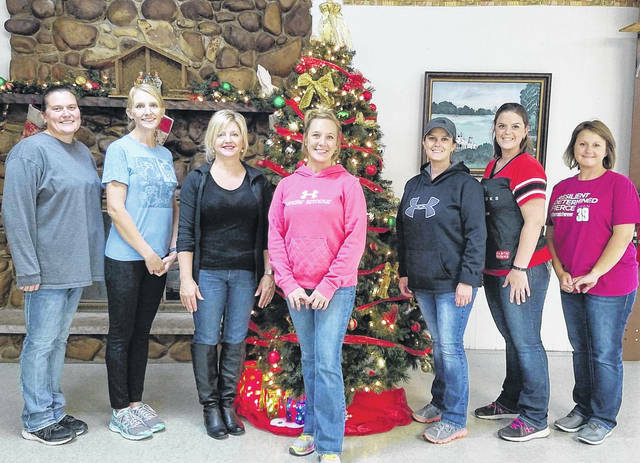 Pictured from left, at a Christmastime fundraiser, are Samantha Smith, Sabrina Hayman, Kendra Thompson, Brandy Hudnall, Shayla Blackshire, Michelle Hart, and Jill Harris. Blackshire and Hart will be doing a two-day walk in Atlanta, Ga., while the remainder of the women will be walking three straight days in Philadelphia, Pa.